The plan for this weeks P52 Self Portrait didn’t go as I hoped. The plan was to take a picture of me and my hubby because I have a photo frame that I want to put a photo of us in (It says love) but I realized we have no photos of us. 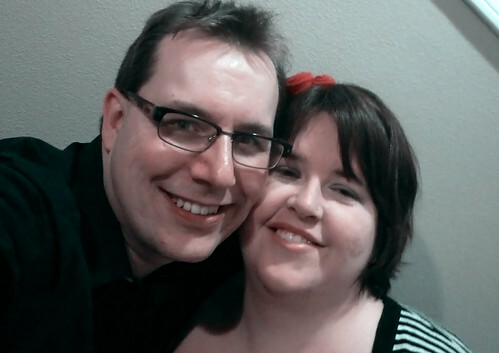 We were going to take the photo on Valentine’s Day when we left for our date night, but my MIL was over 40 minutes late so all the light was gone by the time I got to take the photo. I finally got one that didn’t look silly as far as the pose goes and wasn’t horribly blurry from the lack of light. But the photo was way to “warm”, I should have used my white balance like Lynda had just written about. But I was in a hurry and the boys were running circles around us. I know it’s okay, but not very spectacular. Maybe next week I will do better! Awww! That’s a really cute shot of the two of you together!